OUR verdict is IN! Les Journées Européennes du Patrimoine are awesome! All it took was a little research & planning, a full tank of petrol, and our trusted GPS. Oh, and the alarm clock to rouse the family. What are the Journées Européennes du Patrimoine or European Heritage days? – Created by the Ministry of Culture in 1984, national museums and historic monuments are opened to the public for free or at a reduced rate on the third weekend of September every year. All weekend long, well-organized guided tours, animated demonstrations of old techniques, concerts, theatrical performances, and more, shed a special light on French heritage. We were intrigued by the notion that sometimes the public is given access to things that are not normally open. This year we tried and tested it for you in the Vendée. We'll tell you where we went, what worked and what didn't, and... how much money we saved! Route Planning and Preparation – Because we were not sure what to expect, we scheduled our time and driving conservatively. For practical reasons we also decided to keep our route in the south-Vendée rather than venturing across the entire area. We truly wanted to see exactly how much we could save by being frugal and meticulous in our planning. Day 1 would take us from our home to Fontenay-Le-Comte in the morning. 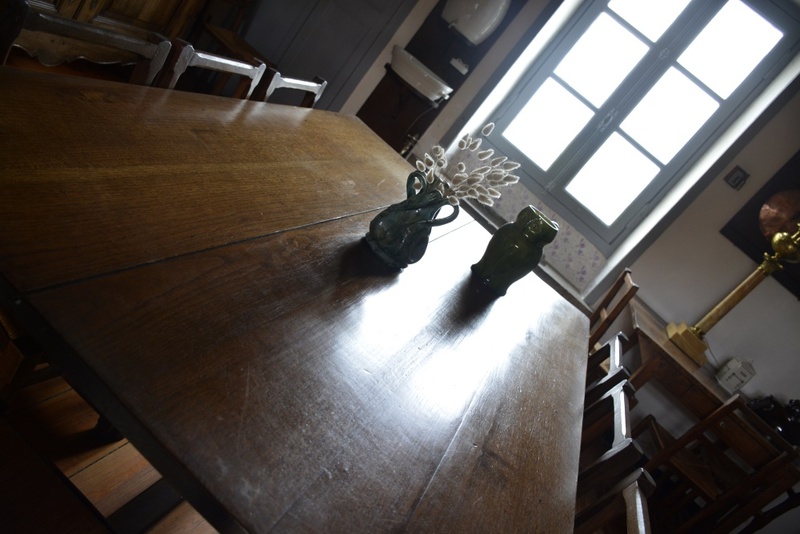 Then we planned to have a meal at home, followed by our event excursion to Maillezais. Two locations, but the latter would last several hours into the late evening. Day 2 would bring us from our home to Sigournais, back home for lunch, then to St Michel en l'Herm and Jard-sur-Mer. Three locations in total with a picnic by the Atlantic Ocean - which also required some shopping in the morning, and freezer-packs and coolers. Total fuel used: our car does around 700km per tank, so a little over 1/2 a tank if the GPS is kind to us! Journées Patrimoine entry fees actual: €?? Lessons learned: please keep reading to find out! Our first stop was nearby at Fontenay-le-Comte where we toured the Chateau de Terre-Neuve. We were among many visitors who thought the Saturday 15th September was also part of the Heritage Days. It was not. The tour by a very knowledgeable and animated guide was fantastic. In particular we loved how he paid a lot of attention to a little girl, making sure she felt included and followed along with her special quest guide. At E9.50 per person though, we would have scheduled this on Sunday instead. But the castle is beautiful. Built ca. 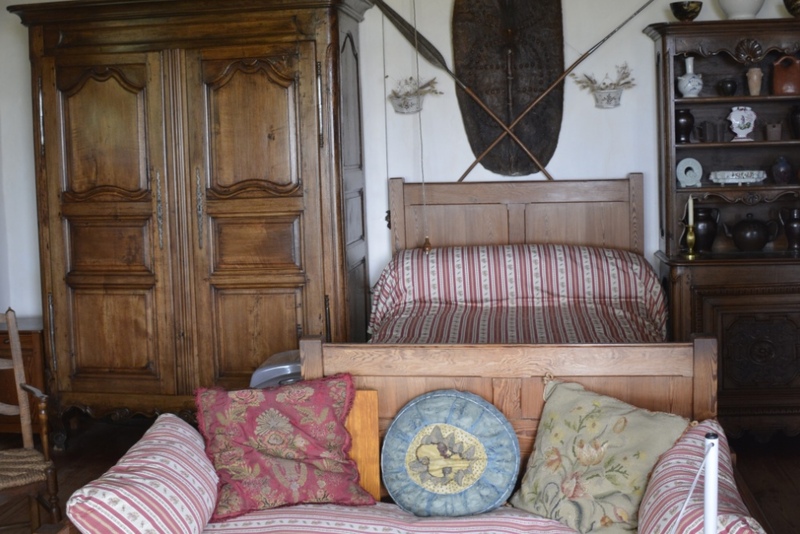 1590, it holds some of the best remaining examples of Renaissance interiors in France. 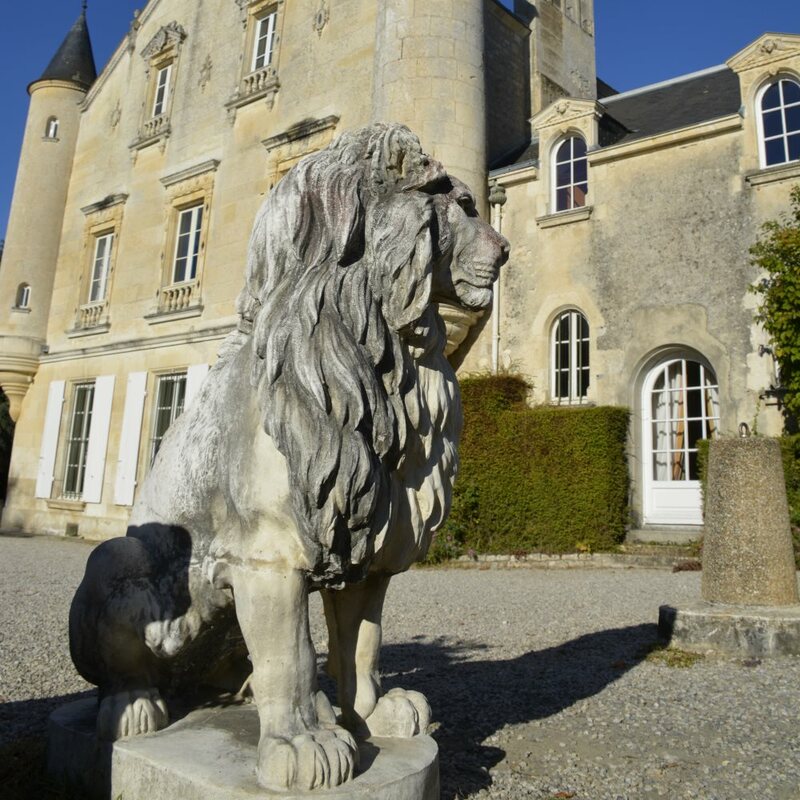 Also remarkable is that 6 centuries into its life, the château remains a private residence. There is something quite magical about hearing young children at play through open windows with billowing curtains. 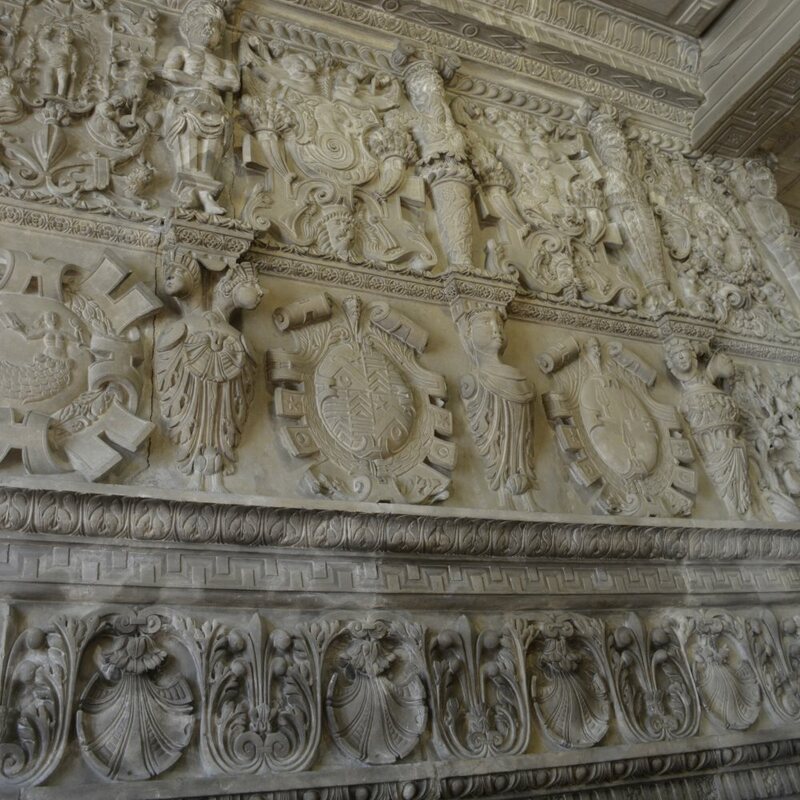 Its most famous owner was Marquis Octave de Rochebrune, who famously created 492 brass etchings here, among which incredibly detailed works of Chambord and Chenonceau. The castle is also forever linked with Chambord, as some pieces were rescued from the hands of the revolution and installed here. Nearby Sightseeing – Crypte in the Notre Dame, strolling along the banks of the Vendee river and the interesting buildings near the Notre Dame. This is not the only time the abbey is mentioned on the site, but we love to visit for any cultural events that are held here. Including this weekend of the Journees Patrimoine. Also, our family had never visited the abbey. 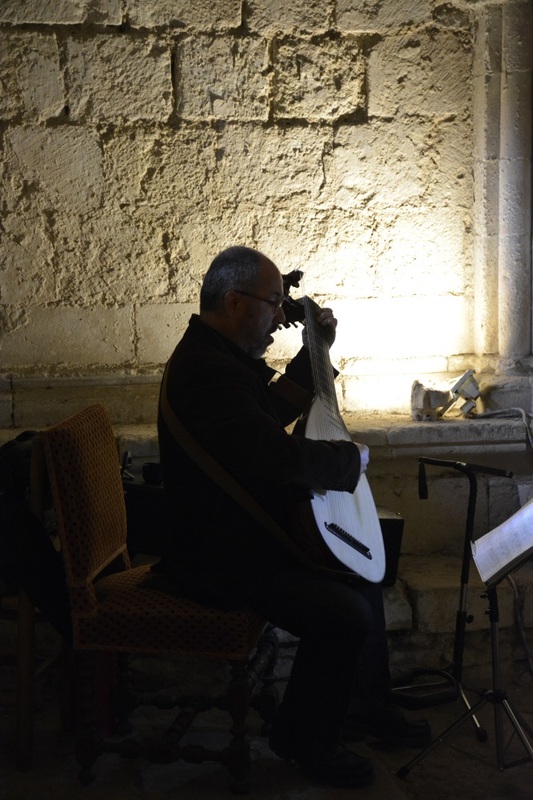 We arrived late afternoon, before the start of the medieval music event which was held in the courtyard of the abbey. This allowed us to tour at leisure and to sit in the shade to listen. After this we went in search of food at La Grange Aux Roseaux where I'm sorry to say we had horrible service and half the things on the menu were not available. 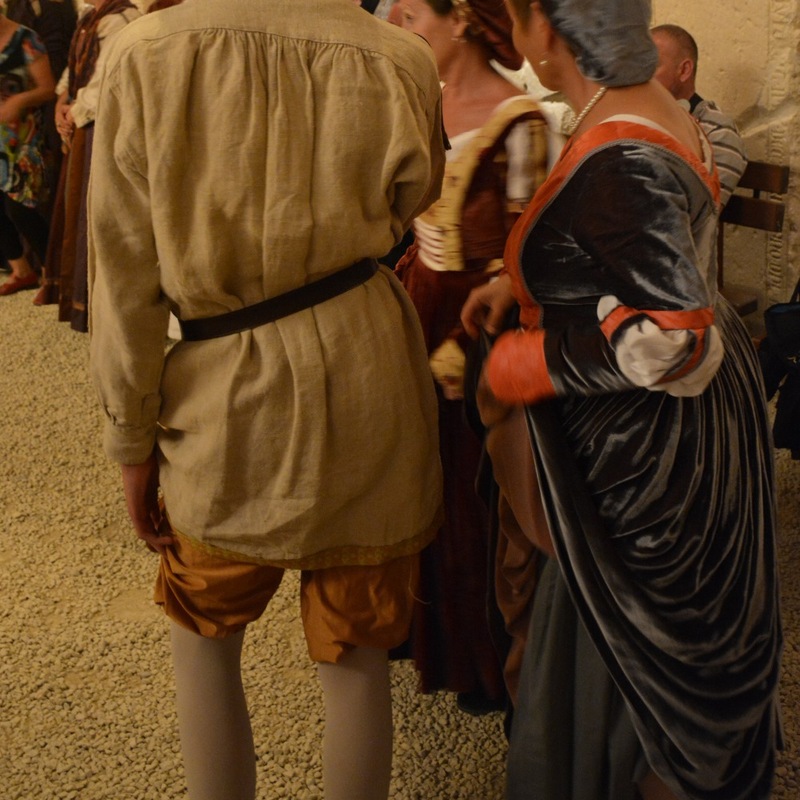 Later that evening we thoroughly enjoyed the Renaissance Ball at the abbey. 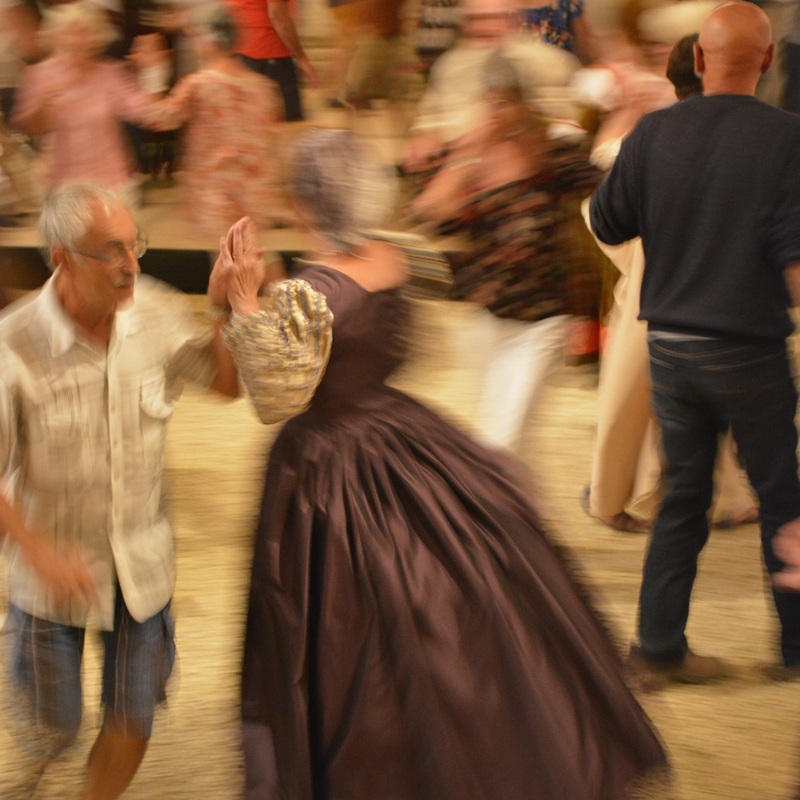 A group dressed in period costume led the rest of us in learning to dance Medieval style! There was singing, and an engaging host blared the steps and the history of the misc. dances through a microphone (not a medieval one HA!) It was a fantastic demonstration of medieval dress for the different classes of people in that time and everyone seemed to be having a ball. Unfortunately dancing and twirling about on a gravel/sand floor stirred up a lot of dust which proved tough on the eyes, breathing and the camera. There is no question you should experience this, however! I will be back, and then it will be to participate fully in the event! Open – Closed from 12 November to 28 February. Schedule. We had a mad dash to Sigournais in the morning on the second day as it is quite close to our home. You'll notice that I didn't take any photos there. When Nikon and I leave the house we lose all sense of time. There was a lot of driving yet to be done and we were on a tight schedule or our tour at the Abbaye Royale in the afternoon. Unique about Chateau de Sigournais is that it is a castle that was restored in the 15th century on the foundation of an earlier one (anno 1000.) In its restored state, the castle represents one of the best preserved examples of a military donjon in the Vendée. During summer months there are often interesting exhibits and the castle and its gardens are definitely something to see. Special attention is granted to the young visitors with a Knight's Challenge game book. 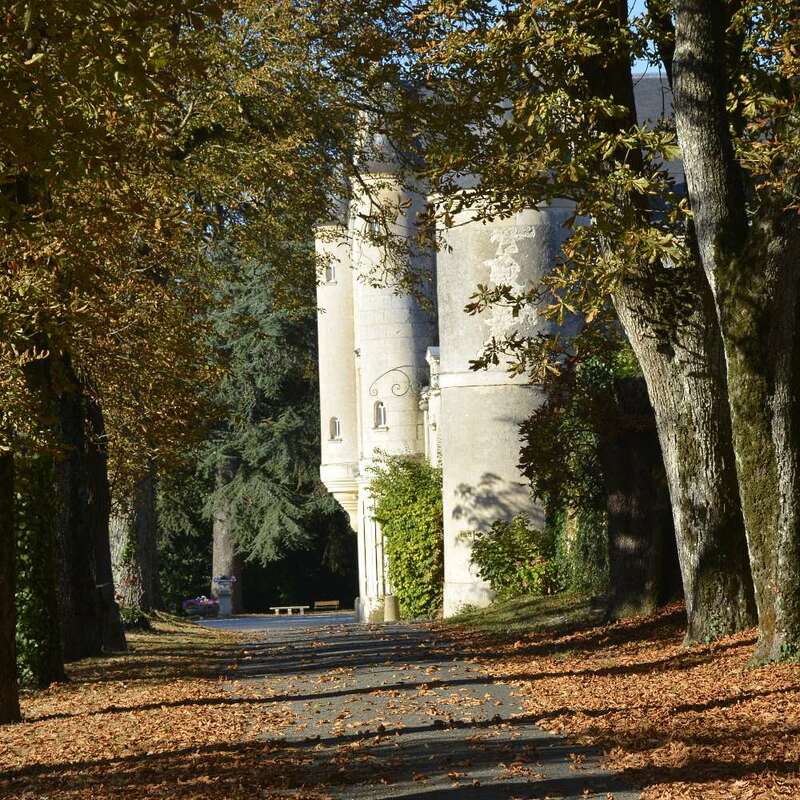 Tip – Participate in the rando (hike) with meals and visit to the chateau, hopefully they will organise it again in 2019. Sadly this year's was cancelled due to lack of sign-ups. 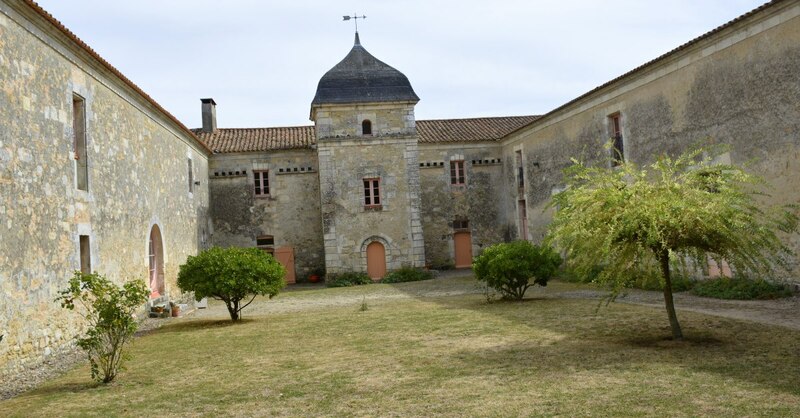 This abbey in the Vendée is definitely a favourite for yours truly! I would move into the scriptorium today if it had a roof. Thankfully, it doesn't and that's what makes this such a special place. For this special occasion, and last weekend it would be open this season, many extras were added to the tour, such as medieval music acts. And more! Which is why I'm so elated we didn't skip it! The Abbaye Royale as it was, is now split into two different portions. What used to be the Monk's Quarters (see main image) is not normally open to the public, but it was today and the person who owns it now was quite thorough in walking us through its history. We were not invited inside though as it is his private residence now. But he explained that centuries ago it was where the 12 monks of the abbey resided and also where the kitchens were located. 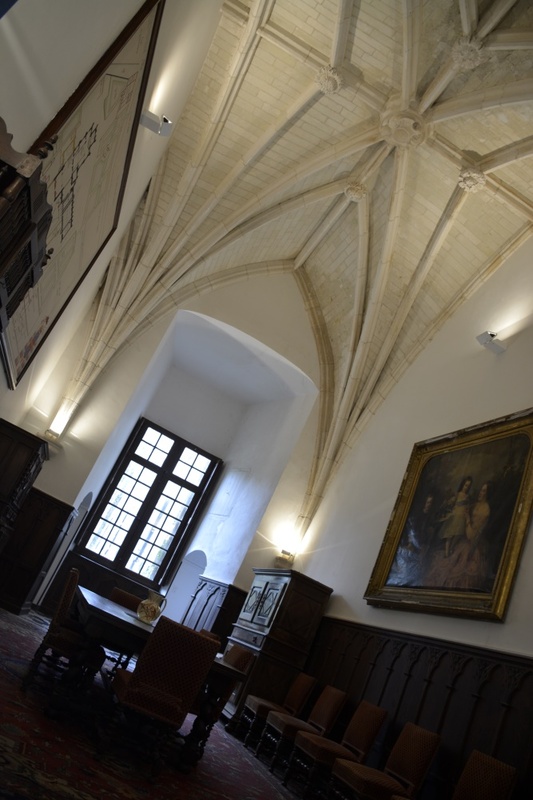 Additionally, the owner of the main abbey gave a personal tour of the Abbot's dining room, which is part of the private section of the abbey. The height of the ceiling - indeed the ceiling itself, is quite jaw-dropping. Funny tidbit: the height is actually so severe that the kind lady of the house used an extended cob-webber to point to the map. Here we learned that the abbey - which had been quite large - was dismantled and many of the homes in the village were built from its stones. Tip – tickets Tourism Office near the abbey. Picnic area across from the church in the village with a medieval veg garden and photo opportunities. Nearby sightseeing – The church in the village is also worth a visit. Additionally, Faute-sur-Mer, adelightful village by the sea with many restaurants, cafe's, and stretched out golden beaches, is not very far away! 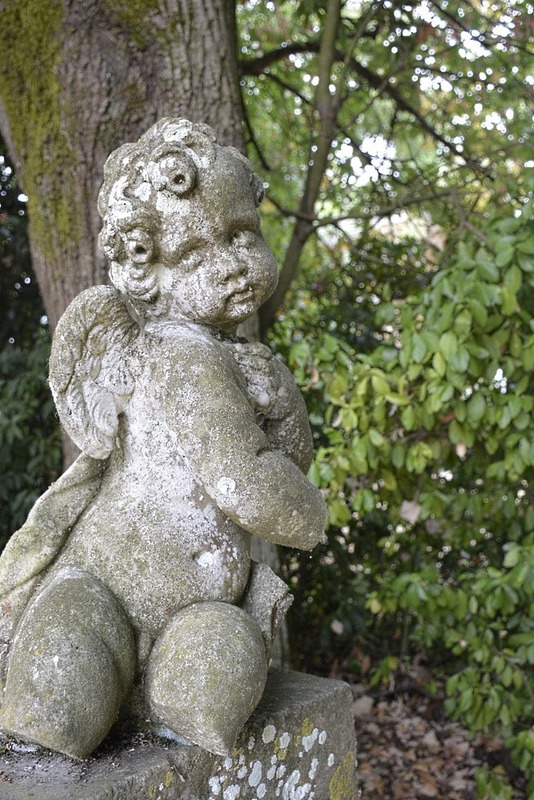 From there it was an easy drive to Maison de Georges Clemenceau in Saint-Vincent-sur-Jard. What a lovely home! 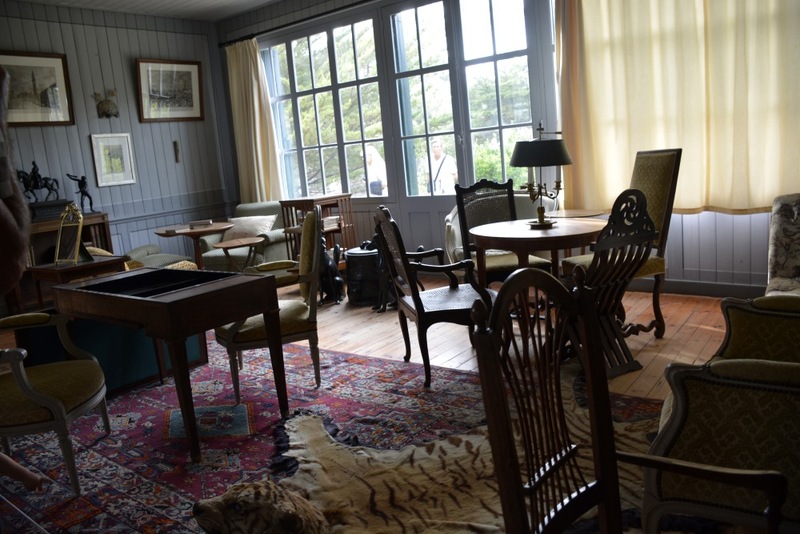 The longère (ground-level country home) by the sea is where the French president found refuge to write several books, even before retiring from political life. The home is beautifully furnished and well-maintained. That he was a fascinating man who remains locked in the hearts of many, was evident in the long queue at the entry door. Rather than wait, we enjoyed our picnic in the small park next door. Personally, I could live in this house, as it is (though minus the tiger in the sitting room). It is tastefully decorated and practical, with a lovely outdoor space facing the small bay of the village. What makes this location truly remarkable is its testament to the friendship between Georges Clemenceau and the famous impressionist painter Claude Monet. 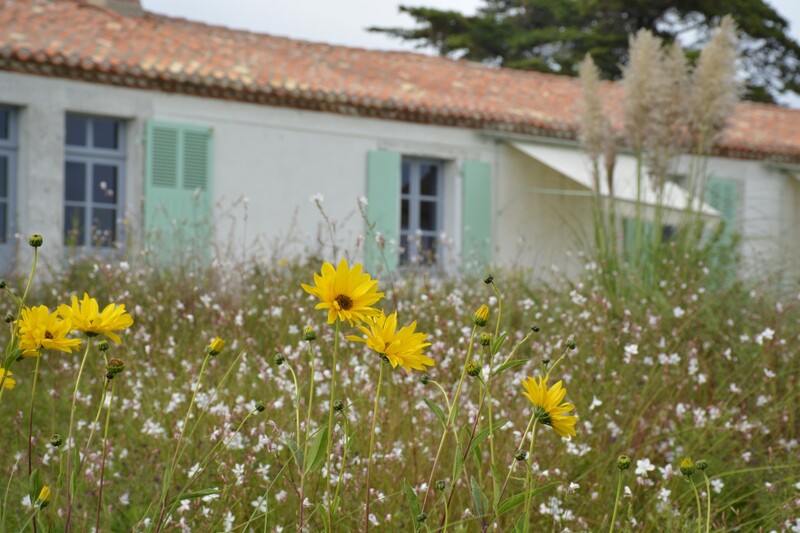 Through correspondence between the two men, the garden has been restored to how it was when Clemenceau resided here. There is still plenty to see and rumor has it the Journées Patrimoine 2019 may be extended to three days instead of two. If it were up to us, we would definitely recommend that Vendee Tourisme sponsors this idea! wonderfully, French people also take advantage of the event to travel locally. Tours and guides were in French, but some websites offer English language PDF guides to download and that would have been good for our English-speaking family. Sometimes they were locally available, but not in great numbers. Or they were for sale but that too, adds up! Journées Patrimoine entry fees actual (4ppl) : €62 which translates to half-price. Had the castle of Terre-Neuve been free, it would have been a steal for so much sightseeing. There is no question that so much driving around in just two days took its toll. Truth is we needed a couple of days to recover before we took our family to see more of the Vendée. But we're very happy to have made the most of the weekend nonetheless! We deem our adventurous tour great fun, and a great success.